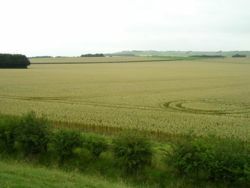 Wiltshire is a county in southern England. It contains the city of Salisbury, the railway town Swindon, and the ancient stone circles of Stonehenge and Avebury. It is largely rural, with many chalk hills - a notable landmark is the Chalk Horse of Cherhill, the silhouette of a horse formed in 1780 by removing the soil from the hill. Wiltshire is in the South of England and has a pleasant climate that is warmer than most of England. This page was last modified on 7 August 2010, at 10:04.